From learning how to build a shelter with sticks and leaves, to starting a fire with no modern tools, our students have the time of their lives while learning skills that not only keep them alive, but also strengthen their connection with nature. Our programs for children are filled with stories, games, activities, demonstrations and hands-on participation. We strive for every child to leave our program excited and passionate about nature with a sparkle in their eye and a bounce in their step. The four elements of survival – Shelter, Water, Fire and Food. Our approach to these skills is gentle yet effective, based on understanding your environment and how to relate to it, focusing on nature connection rather than fear. It takes at least one class to cover each one of the different elements of survival. Using only natural materials found in nature and specifically in our area, we will teach how to make crafts that are not only pretty and fun but also useful. Each child will bring their project home to keep and continue learning from. Some examples are containers from the elderberry tree and different kinds of cordage (natural rope that they learn to weave themselves). There are an array of activities we teach that will be a fun exploration into nature, using games that are designed to strengthen your child's senses, enhancing their everyday experience and awareness wherever they are. This is also where we integrate teachings from the animals, including tracking. Plants are our allies, and it is important to be able to recognize them. Depending on what age group your class is, we can start teaching children how to differentiate between the tree from the forest, teach them different edible, medicinal, and utilitarian uses of plants, and play games to help them start to recognize their plant allies. 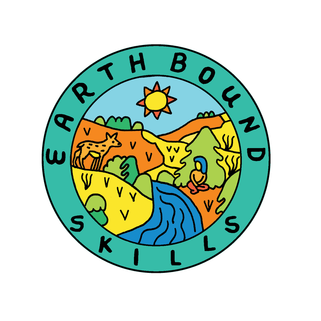 Would you like Earthbound Skills to come to your school? If you are a teacher or principle and would like us to come and teach programs for your school, please contact us. We can design any course to fit your curriculum and we are available for in-class visits or field trips. If you are a parent and would like to come and teach programs at your child's school, contact us and we can send you some brochures to give to your teachers. If you are homeschooling your child, we have ongoing home school programs that you can sign up for.